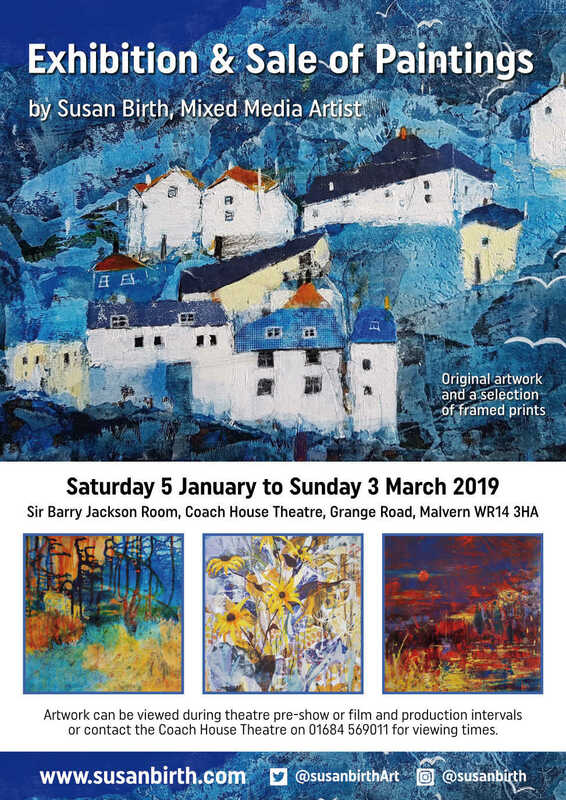 The Exhibition & Sale of my artwork at the Coach House Theatre, Grange Road, Malvern WR14 3HA from Saturday 5 January to Wednesday 20 March 2019 proved very successful! Original paintings and framed prints were on display in the Sir Barry Jackson Room along with a selection of mounted prints, cards and calendars. Visitors to the theatre’s films and shows appreciated the new colourful environment during intervals or pre-show. 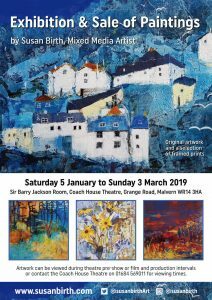 My thanks to the Coach House Theatre for looking after my paintings so well over quite a long period and for the very pleasing sales, especially in the last month! The venue is now host to more colourful artwork by fine art graduate Georgie Ferguson. My painting ‘Blue Hillside’ featured on the flyer was one of the original paintings sold.